It is replaced by the Epson TM-H6000ii. 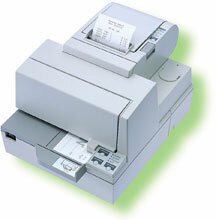 Thermal & Impact, receipt & slip printing, parallel interface. Includes auto-cutter. Order cables & power supply/AC adapter separately. See accessories. Color: white. Thermal & Impact, receipt & slip printing, parallel interface. Includes MICR & auto-cutter. Order cables & power supply/AC adapter separately. See accessories. Color: white. Thermal & Impact, receipt & slip printing, serial interface. Includes MICR & auto-cutter. Order cables & power supply/AC adapter separately. See accessories. Color: white. Thermal & Impact, receipt & slip printing, serial interface. Includes auto-cutter. Order cables & power supply/AC adapter separately. See accessories. Color: white.